This Is Not Popeye’s Spinach…. My husband and I were grateful to crawl into bed last night and zone for awhile after a busy several days of holiday and whooping it up for his birthday. The recovery time is not what it used to be! We did enjoy watching Guy’s Grocery Games on the Food Network last night as a friend of ours, Luca, who is a wonderful local chef won the game. So that was pretty cool. But that was the extent of the excitement we could take. 🙂 As many of you know Thanksgiving is my favourite holiday but we had it on Friday this year as it wasn’t our turn to have the kids for the holiday. My parents and aunt joined us but my sister couldn’t come as we’ve synced up the holidays so when it’s our Christmas they come too and same for Thanksgiving. That way all the kids have a chance to be together. We got our turkey at a local farm and we were late ordering it so I was worried how big it was going to be. Fortunately they still had a relatively small one at 13.9lbs. So it fit in the fridge! We did do the traditional mac-n-cheese, gravy, and roasted veg but I wanted to mix it up a bit with other dishes this year. To keep us sane we did a lot of food prep the day before. We were still very busy the morning of though. I was a bit surprised at that since we planned ahead! 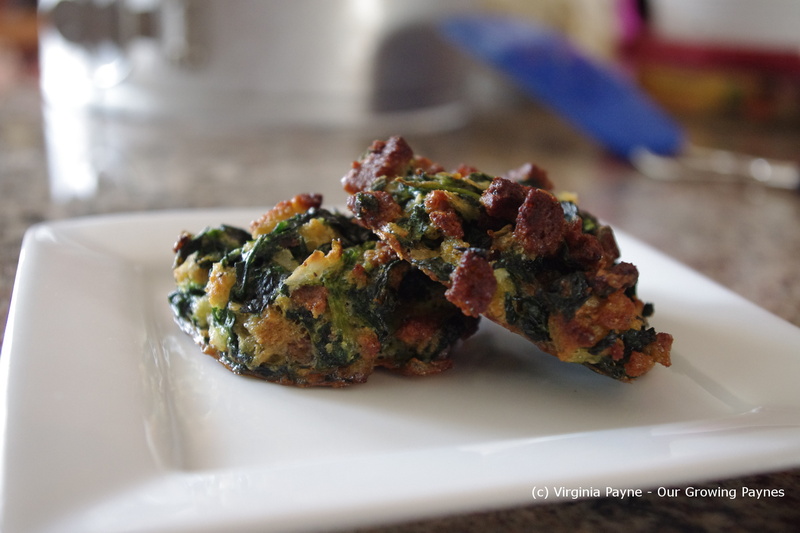 When I was a kid the only two ways I would eat cooked spinach was my mum’s spinach quiche and my Grammy’s spinach balls. Because I really don’t like cooked spinach. I mean, why would you take a lovely green and kill it that way? When I had a sense of smell I couldn’t stomach the smell of cooked spinach and the texture threw me. But mix it with wonderful ingredients and bake it and I’m good to go. I’m not sure where Grammy got the recipe and if she was the first in our family to put it on the table but it has been passed on to be made for parties and special occasions. Of course I changed it a bit because I wouldn’t be my mother’s daughter. I like to think mum got the habit from her mum. I also made these for Halloween and I was surprised to see one of our friends who doesn’t really care for veg enjoy these. Cook 20oz of spinach and drain. Melt 3/4 cup of butter. Set this aside to cool a bit. 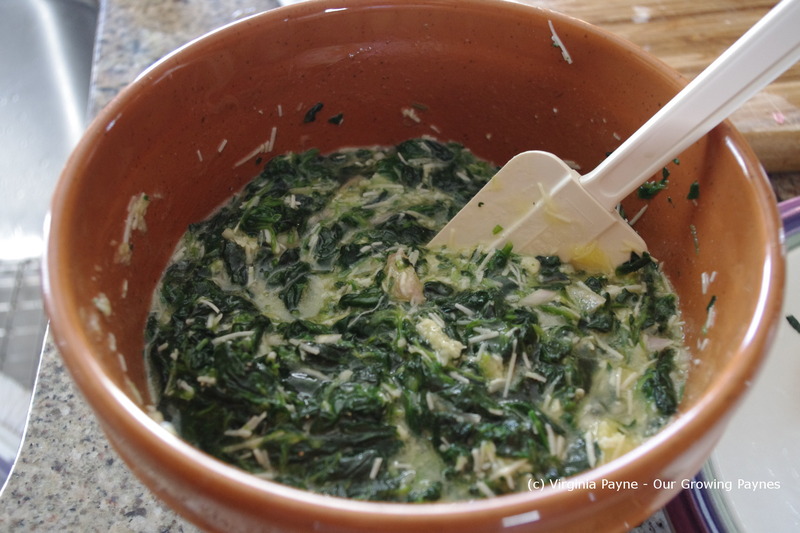 While the spinach is cooking beat 6 eggs together, chop a medium sized shallot and 2-3 cloves of garlic, and grate at least a cup of fresh parmesan. When the spinach is ready add the spinach and butter and mix well. It was at this point I realised I should have made sure I had all the ingredients. This recipe needs 2 cups of stuffing you cook on the stove. I had about a 1/4 cup. So there was a mad dash to the store and a mad dash back. A bit of a rookie mistake! Mix in the 2 cups of stuffing. Form into balls and place onto a cookie sheet. These do spread when baking so treat them like cookies. The original recipe calls for 20-25 minutes to bake, my Grammy had written 30-35 minutes. If I bake on regular then it takes about a half an hour. I chose to do convection and it was about 15 minutes. Good thing I checked. It depends on your oven. If you can serve right away. We had to do these about an hour beforehand because our bottom oven needed to be in constant use while the turkey roasted in the top oven. We put them on an oven safe plate and popped them back in for a couple of minutes to warm through. 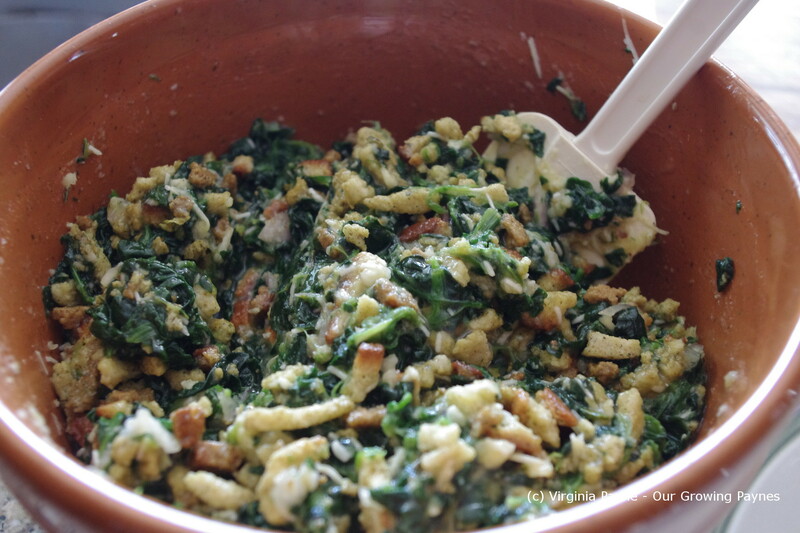 This entry was posted in recipes and tagged appetizer, baking, cooking, egg, food, parmesan cheese, spinach, spinach balls, starter, thanksgiving, vegetarian. Bookmark the permalink. It’s basically the generic kind of stove top stuffing. It’s rare we use an ingredient like this in our cooking as we try to avoid “junk” food but it works in this recipe and it’s only once in awhile. 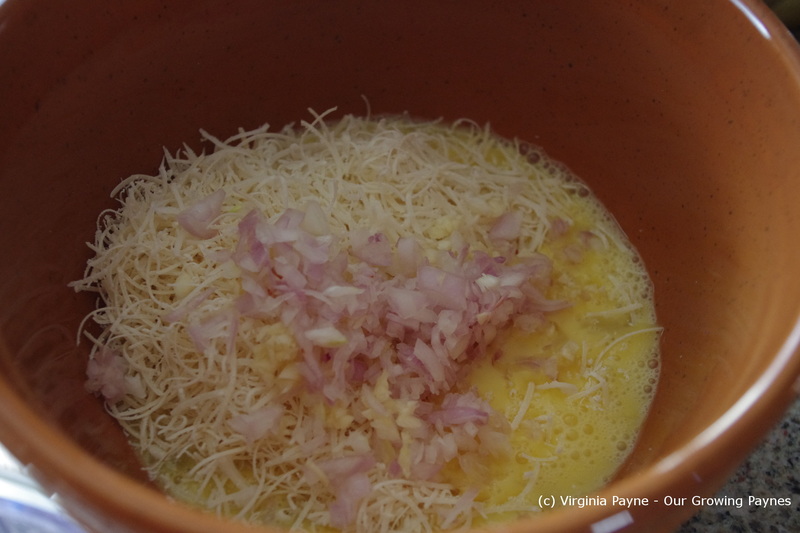 I think if you have a bit of bouillon and homemade bread crumbs you could make this work. The flavour we use is chicken flavour. This looks delicious. Next time I make stuffing, I will do it this way, my mouth’s watering! It’s a great starter for parties as well as it is finger food. 🙂 Glad you like it. Thank you. :). I think memories tied into food are wonderful. I often use the same ingredients to fill pies (except for “stuffing” – which was completely unfamiliar to me). But this sounds wonderful for a change. I’ll try it soon, thanks for sharing your grandmother’s recipe. These are a great idea, I think I’ll try to veganize this recipe. It should be easy to do. 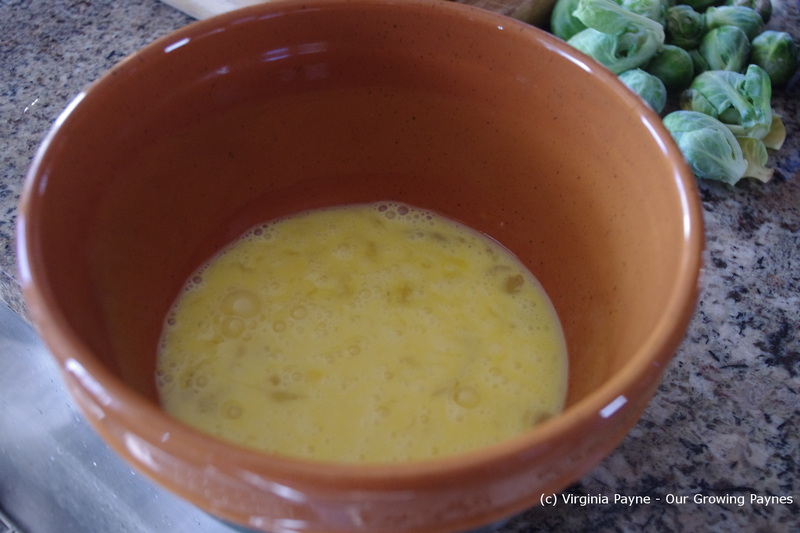 What do you use to replace the butter as it calls for a lot of it? I use non-dairy butters, earth balance is my favorite. I don’t mind buying a lot since we don’t spend on meat or cheeses. I have also used non-dairy margarine (not all are non-dairy, some have whey so you have to check the label). I think the egg could be replaced with olive oil and flax seed. Do you mean flax seed or flax seed oil? The egg is the binder for this. Yes, but without the egg (in a vegan recipe) sometimes the combination of olive oil and flax seed can come close to the correct texture and binding qualities as an egg. Interesting. Looking forward to hear how it comes out. Hehe, we’ll see! I’ll let you know! I know what you mean about recovery time after a four day holiday. There was that and we sort of tied one on for a get together out on the town to celebrate my husband’s birthday. So it was a one two punch! Intrigued by these. Partly as I assumed you were going to be making some sort of quiche as I was reading through. Then, suddenly you’re off to the store to buy some sort of stuffing mix! These do sound nice! I’m looking for exciting ideas for stuffing alternatives for Xmas Day. Will have to bear these in mind. Do I follow you on FB, btw? My next post will be stuffing balls. :). I’m pretty sure you are following me on FB. I’ll have to check. I gotta try this! It looks AMAZING! I should make these more often. I hadn’t made them for years until October. But they are good. Absolutely. The family memories are the most important bit.